and now my hand is ready for my heart: intimate histories is a bio-play written and performed by Nicky Paraiso. The show’s dynamic staging comes from John Jesurun and features a strong ensemble of dancers. On stage are four chairs, a piano and two curtains used as projection screens. Beginning the story without context, we feel claustrophobic and offended, held captive by someone talking only of himself. Unable to escape the long winded life story of a relentlessly selfish figure we’ve never met. Thankfully, as more details accumulate, these irritations dissolve and we find ourselves astonished by Nicky’s enchanting story. An everyman-autobiography. A profound and touching historical document. An archetype of artist life in New York City. It’s an intimate journey, one performed at La Mama until April 7th, and it deserves to be seen. And celebrated. Nicky Paraiso studied music at Oberlin and received his Masters in acting at NYU. A fixture of New York City’s experimental theatre community for over 40 years, and a full time waiter while in his 50’s, he’s created work alongside legendary theatre makers and now serves as a curator and program director at La Mama. He doesn’t have a Wikipedia page and he’s not a Broadway, film or tv star. I’d never heard of him and there’s a good chance you haven’t either. He’s experimental, relatively unknown and now he’s performing an autobiographical one man show. The play opens to a sepia colored, post-war photograph. Projected upon a delicate white curtain, it features a young boy standing in the yard of a two story family home. Five bodies enter the playing space. One sits at a piano and begins to play classical music. His electric body expressing every note. Until he stops. Rising from the keys, he begins to speak. This man, we discover, is Nicky, enumerating early childhood details while dancers gently glide and float through space. A story and a dance. Two distinctly separate entities functioning simultaneously. Movement without context alongside description without context. Mr. Paraiso’s eyes fixate on the ground and not on us. Anxious, stumbling and perhaps a bit ill-prepared, he rushes through his story. Carrying on about himself and convinced no one will listen, this unsettling experience persists for about 20 minutes. During this exhausting period, we find ourselves more obligated to remember details than compelled to hear. After we’ve been so tediously force-fed details and so inundated with backstory, around the time Nicky graduates from NYU, we’re surprised to discover a profound attachment to his story. Nicky travels across time, incremental event stacked on incremental event. Through his childhood living room playing Beethoven. Past the dark, blue-lit hidden adult corners of spoken word romance in jazzy clubs. Loosely strung together fragmented existence. The projector beams a decade old recording. We’re a fly on the wall at a lively brunch where Nicky’s friends berate him for not standing up for himself. He sits tucked away in a corner, timid and smiling as they criticize his unstable love life. Later, we live through his parents’ death. Later still, through an inheritance irresponsibly managed. And then most central to his life, we witness the apparent impact from working alongside luminaries of American theater history such as Meredith Monk and Jeff Weiss. We follow Nicky until we’re stopped. Frozen in space to observe a once-upon-a-time performance. A demonstration of a character formerly played. A dictator, performed without word. A dictator defined by movement and gesture, expressed from powerful sensation. Then back to the story. A dear friend is dying. He asks Nicky to sing at the funeral and we stop along the way to sit and listen. It’s filled with trauma and love and heartbreak and the void from loss. In these examples, we’re not told a story. We experience Nicky’s most precious moments of life through his artistic technique- the lasting impression from working alongside luminaries of American theatre history. “Why are we up here?” The dancers ask. “I wanted us to make something together!” Nicky exclaims. They’re his friends. Because this play is about community. It’s an ode to life-long appreciation and participation and chased enlightenment. It’s community as an inspired collection of people maintaining up and down friendships over a vast period of time. Of unstable love and heartache and shattered dreams and taped up hopes. Of a community where you know everyone because you can point to them. And they point back at you. Your story isn’t yours, it’s shared. It’s everyman’s. Shared intimate histories connected through art. And this story, Nicky Paraiso’s story, is his. But it’s also ours. The everyartist. ​To document your mother’s suffering as she dies from cancer requires courage. To expose a family’s feelings and desires throughout that traumatic time might be even more burdensome. Right now, Primary Stages has produced God Said This by Leah Nanako Winkler. Written by Leah Nanako Winkler and directed by Morgan Gould, The Primary Stages production of God Said This runs through February 15. Based on Winkler’s experiences, the play sizzles with clever dialogue and well documented behavior. But without suspense or clear character motivations, God Said This struggles to engage. Masako is a mother and wife. And she has cancer. She’s hospitalized and undergoing chemotherapy with the support and visitation of her family. Her husband James is a recovering alcoholic. Hiro and Sophie are their two daughters. Sophie is religious and married, Hiro is not. Hiro and her father have a painful relationship. Near the start we meet John (Tom Coiner), a responsible former classmate of Hiro’s who has a charmingly capricious temperament. Together, he and Hiro smoke pot and confide in each other. The play cycles through these relationships. A fascinating characterization of the alcoholic father is embodied by Jay Patterson. A kind spirit shackled to a hopelessly addictive personality. If it’s not alcohol, it’s a rock collection. He’s mostly bald and his gut protrudes and his feet sprawl out as he walks and his body is dried out from years of boozing. His clothes are disheveled and he knows how to talk; like habits grown from his friendly drinking years. And then James recalls first meeting his wife. Mr. Patterson descends into the audience to meet her memory. His eyes glow from a profound, grateful love surpassing all barriers of time and space. From up close we experience the feeling of companionship from a gifted actor. Through the commanding Ako (credited as her full name) we experience Masako’s dynamic and exhausting stages of her devastating journey. Drugged-up optimism. Shameful helplessness. And Masako’s anger and hatred and violence; desperate to escape her failing body’s prison. Despite these powerful performances, we rarely experience lasting conflict or suspense. We experience notable flare-ups of confrontation, but they dissipate as quickly as they arrive. The overuse of low stakes expositional dialogue also help to stave off tension for large portions of the play. Hiro (Satomi Blair) misses her period and tells her family-oriented sister, Sophie (Emma Kikue). Sophie reveals to Hiro that she can’t have children. This escalated conversation acts to further articulate a bitter conflict between the two sisters’ conflicting lifestyles. But it’s never been noticeably alluded to previously in the play. And then it’s never brought up again. Outside of added information, the conflict doesn’t contribute to the subsequent events, plot or forward momentum of the piece. God Said This opens with a monologue from James. He stands on stage to speak to us, his AA group. We are his receptive, open, accepting group of people. 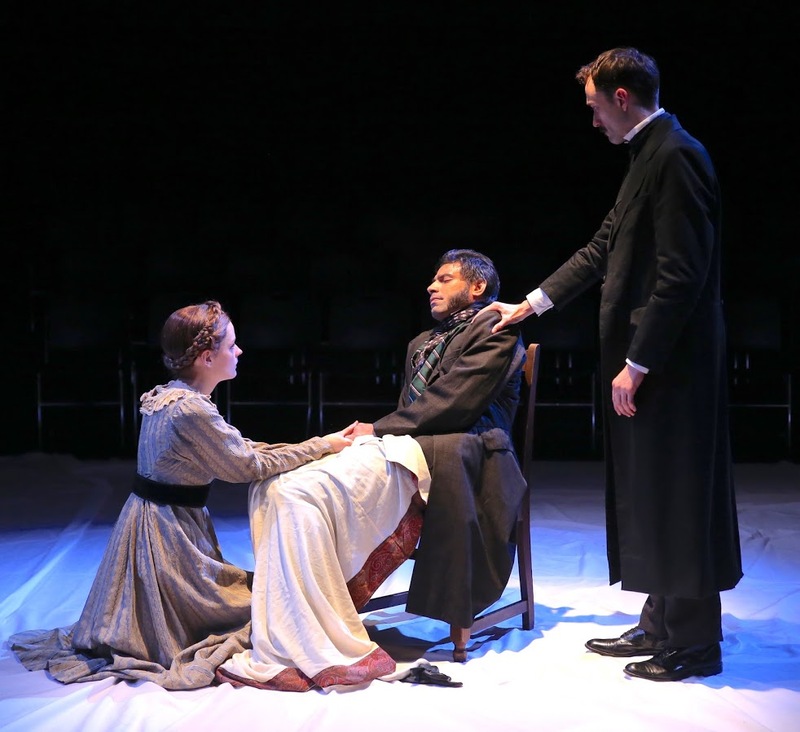 Like a therapy session, this structure, repeated throughout the play, removes James from conflict and allows him to safely tell the audience what they should know about his background and the background of his family. It nullifies immediate conflict and we find ourselves forced into listening opposed to feeling compelled to listen. The play’s observations are painful to experience, but you can’t help wonder what God Said This is actually trying to say. Yes, cancer is terrible and it happens to sweet people. And families are tormented and traumatized by the experience. But that experience is so common and so traumatic that many people are already able to articulate those haunting observations themselves. At the play’s conclusion, some stood in applause. 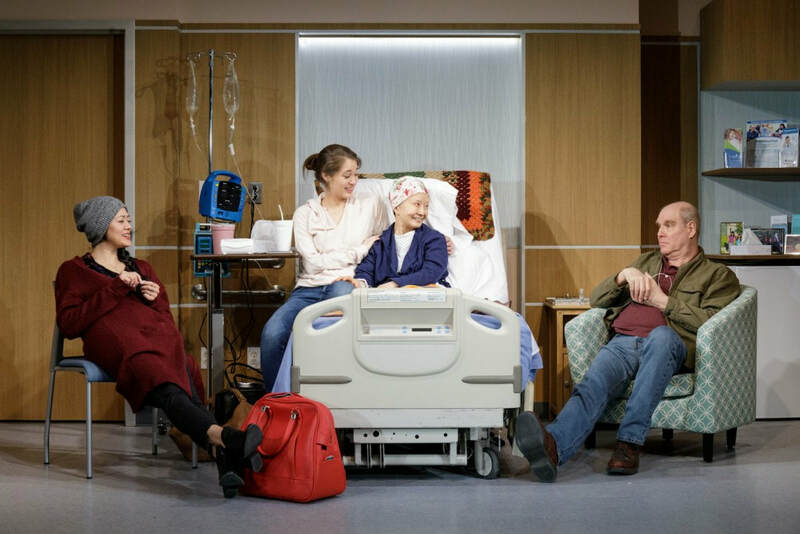 I have a feeling their response has more to do with never having witnessed cancer’s effect on the human body and spirit, moments which the play carefully observes, or a projection of their personal experience caring for someone with cancer, as opposed to something newly revealed. God Said This is a noble and brave undertaking directly from Ms. Winkler’s life. And her sharp observations brought audience members to tears. However, a play expressing the feeling of her unique experience is as important as it is challenging. Revealing physical observations is one thing. Revealing family relationships and hidden motivations during the most monumental crisis of their lives would be a remarkable achievement. And God Said This doesn’t quite reach those heights. Primary Stages supported a talented and accomplished writer fighting to say something about the most challenging period of her life. And if what she has to say is important to her, that journey might not be over yet. 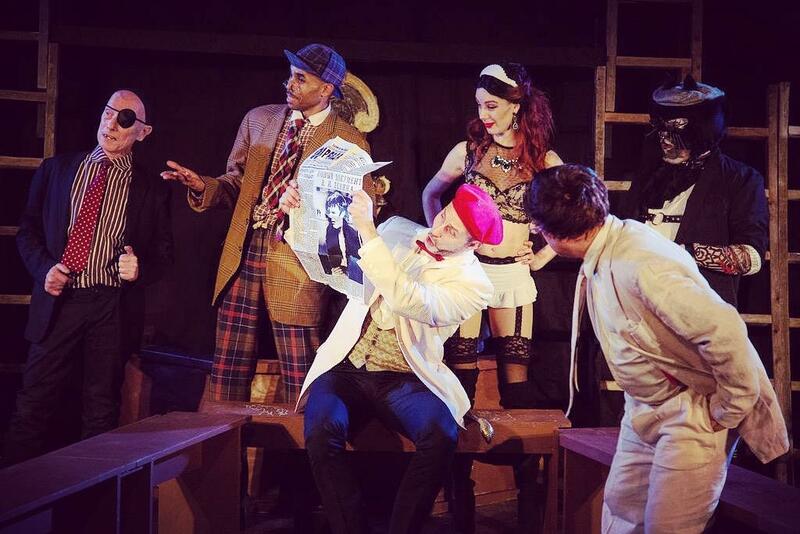 When your show is titled, Medicine the Musical, it’s easy to jump to conclusions. Even before walking into the theater, I envisioned a half-baked, money grabbing spoof. And I hoped to be proven wrong. And I was proven wrong. Mostly. But I was also proven right. The new musical by Michael Ehrenrelch is held together by a talented cast and directed by Joey Murray. It’s playing at HERE Arts Center through November 18. Full of 90’s rock and characterizations you’ve seen before, this production unabashedly embraces Cliché. But if you can ease judgment and relax into that construct, the show succeeds as an enjoyable experience despite some irritating missteps. A mysteriously disabled doctor with limp and cane (aptly named Prof. Crutch). A troubled young man, post incarceration. Students born of privilege, confronted by those without. A distraught son-made-villain, misunderstood and longing for his father’s affection. Cliché or not, these backstories set the foundation for any depth and sincerity. And if they’re not fully embraced or explored (as clichés often are not), it diminishes the substance of a character and it diminishes the substance of the entire piece. What’s most apparent is raw talent. Every actor/singer on stage has experience and ability. Vocal power and clarity sends shockwaves through the intimate space. Both Prof. Crutch (Dan Rosenbaum) and Christina (played by Sarah Stewart Chapin) electrify. As quickly as these singing actors have concluded saying what they’ve had to sing, the audience bursts with appreciative applause. This reaction is frequent and deserved. Intermingled within these impressive vocal performances, reside subtle moments of great sincerity. Tiff, played with sensitivity and honesty by Marina Laurendi, nurtures and cares for her suffering boyfriend. In her heart, he is more important than she. Near the end, she gently adjusts the skewed collar of his lab coat. Though extremely subtle, this reactive gesture communicates her warm, healing nature. The expression of this nature holds further reaching implications. Providing a poetic connection between Tiff’s love and her professional calling. Of course, there are missteps as well. The casting of one actor is totally distracting. The fault is not the actor’s. One character he plays has a heart attack. Another is constantly lamenting the change of time- the way things used to be when he first became a doctor. Another is a father of a student. The actor cast to play these roles reads to be in his 30’s. The ages required for this track simply require a significantly older actor. This glaring disregard for circumstances distracts and depreciates each of his scenes, resulting in a slight amateur polish to the overall production. This musical was composed by Michael Ehrenrelch, but it’s not surprising to see that additional arrangements and orchestrations were made by someone connected to RENT (Matthew DeMaria). Harkening back in time with satisfying power chords, we are 90’s every step of the way. Electric guitar, electric keyboard, drums. Medicine the Musical isn’t RENT. But its entire soundtrack hovers around an archetype some shared 90’s sounds. It’s infinitely more care free than RENT, expressing significantly less despair and consequently, perhaps because of that, is less varied than Jonathan Larson. But there’s no denying the fun in hearing the band rock out. Director Joey Murray admirably keeps charge of this tight ensemble. The pacing never slows and the energy never wanes. Staging is adaptable on this blank canvas and environments remain mostly specific. ​And through it all. A question still rests in people’s gut: why does this show actually exist? Despite all the entertainment value. Despite all the satisfaction this production brings. There is substance on the page, yes. The characters are given moving histories and desires, yes. But they’re never taken seriously. They’re never given the chance to be fully explored outside the safe excuse shell of cliché. The production embraces these clichés and successfully makes them a part of the experience in several ways. But when that happens, the audience is left with a hollow, wanting feeling. They’ve experienced so many moments deliberately not acknowledged honestly. This production doesn’t really say anything outside of a fortune cookie message of “work hard and you can achieve something, even if it’s difficult.” And that’s upsetting. If the collection of resources and apparent talent involved, more sensitively explored this material, embracing these clichés as reality, audiences would be rewarded. We would experience a piece of art and not an entertaining gimmick. An avid art audience, of any form, searches for the new. A resounding voice, never before experienced, expressing the evolved emotional lives of people today. Independent Study by Ben Gassman isn’t exactly there, but it manages enough innovative elements to make meaningful theatre. It’s running through November 17 at The Tank and you should see it to break from the traditional. This sharp new production aggressively attacking our digital lives is guaranteed to leave you unsettled the next time you find yourself scrolling. GG is a first generation college student. She lives with her brother, Bozo, within a mostly parentless household. Her mentor and former teacher, Prof Mel, is a forward thinking, liberal academic. Both of these women have a brother with extremist viewpoints. Scattered within its loose plot, is a “Hate Chorus” – a chorus for the digital age, drawing connections between hate-fueled digital rhetoric and our hate-filled real world actions. Emotionally charged and violent, the Hate Chorus emphasizes our anxiety-ridden relationship to technology. In one instance, they crescendo by throwing rocks through GG’s window. In separate instance, Finn Kilgore, a talented chorus member, plays a newscaster. Nuanced character work aside, he illuminates how our limited attention span responds to complex information. When details require effort to continue listening and our interest fades, we laugh as his voice mumbles complex information down to nothing. 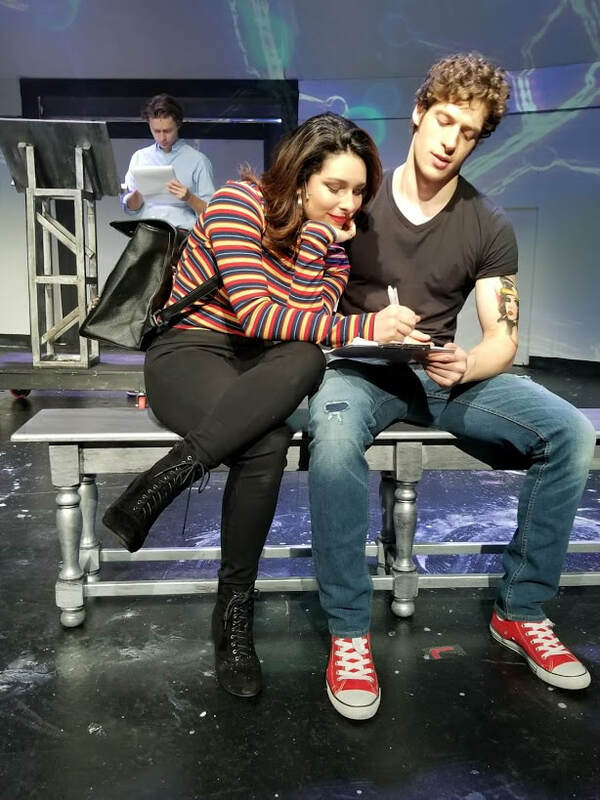 Theatre audiences rarely witness sibling relationships composed with such honesty as the powerful scenes between GG (Andrea Negrete) and her brother (Alphonzo Walker Jr.). Their scenes comprise the finest, most subtle work of the play. Ms. Negrete captures a youthful longing, struggling to fit lessons from school into real world relationships. Searching for new ideas, puzzle pieces, solutions and YouTube prophets, we may only spectate as her frustrations spiral into a kind of youthful madness. Mr. Walker Jr. as GG’s brother, Bozo, inhabits a young man built on love, disparaged from living within a discriminatory culture. Ms. Negrete and Mr. Walker Jr. hold within their eyes a balanced kinship of respect, love and competition. They reveal a brand of affection only possible from developing together in life. An-lin Dauber’s evocative set design provides a sharp, modern palate. Rope lights the color of our blue-lit phones bolt across the stage, splitting it comfortably into multiple environments. Bare, speakeasy lightbulbs dangle above the playing area. Fabric swatch patterns cover flat seating. Transparent cloth fastened to a canvas frame, hangs askew upstage. Rehearsal cubes sit alongside a discarded white roller chair. Everything seems trash picked yet clean, lived in and purposeful. Even before houselights fade, you’re enlivened, imagining how everything works. By now, you may have asked the question, “What exactly happens in this play?” That question pinpoints where the production veers a bit off course. Relationships between GG and her brother and her Professor are clear and revealing. We witness inspired and angsty private meetings, complicated and rich home life, and along the way, the Hate Chorus provides a context to this emotional outside world. But the actual storyline is difficult to identify and we never get a real sense of an arch. That lack of necessary structure forces the audience into unnecessary effort, depreciating a powerful message. And so we’re here at The Tank. A home where artists and audiences search for something new. Something that’s never been made before. Where innovation cracks open structures of the old to breathe life in the now. Thousands of artists come here, to The Tank, to reach into the darkness of the unknown, blindly grasping for light. Even at the risk of that light being artificial. Without collections of people creating new and bold and unapologetic work, like those who created Independent Study, we are lost. We are lost to time and we are doomed to the same. Doomed to the same cozy bubble feeds on repeat. Doomed to the same hateful pundit soundbites. Lost in a maze of the same sickening rhetoric and trolling and hurting. To break this system, we need plays like Mr. Gassman’s Independent Study to create a new chorus. Interrupting our structured conversations. Unapologetic in their efforts to create a more bold, understanding, peaceful world. Emma and Max—now playing at the Flea Theater—is a trap set to deceive us all. Written and directed by Todd Solondz, an experienced independent film-maker who I hope will achieve greater visibility. See it while you can, because this hyper-relevant dissection of our fears, favoritism, shortcomings and blindness will only run until October 28. Brooke and Jay are wealthy Jewish parents of Emma and Max, two young children. Their nanny is Brittany. She is a black illegal immigrant from Barbados who’s just been fired for no apparent reason. When the family replaces Brittany with a white au pair from Holland, we smile and rest on our convenient diagnosis of rich suburban white privilege and racism. The signs aren’t subtle and we aren’t wrong. But as events wax on, we’re forced to confront our propensity for snap judgments. The stage is split into two adjacent areas, a sunny vacation spot and Brittany’s bedroom. Brooke and Jay lay poolside at a resort in Barbados. Brittany lies beneath covers in her drab, windowless bedroom. Jay is asleep in the sun, snuggling his iPad. Brooke speaks to her sleeping husband for the next ten minutes. After attempting to Facetime her newly appointed nanny, she notices the shortage of employees. There must be high unemployment in Barbados and a staff job at this resort would bring anyone dignity. “If you want to have success, it all comes down to attitude,” she explains, stretched out in her chaise lounge chair. “I like totally get the whole white privilege entitlement thing,” she says, hurt that some people may find her unsympathetic. Suddenly, Brooke describes her childhood. Her mother was dying of ovarian cancer. Her brother was mentally retarded. She had weight problems and a skin condition. School girls would tell her she’s lucky to be so ugly because she’ll never have to worry about being raped. This is the continuum of the play. And it does not slow or alter. The audience will relentlessly laugh at a character until a tragic detail of their past is casually revealed. And then you can watch that same audience scan amongst the crowd, seeking guidance of how to appropriately respond. It’s a fascinating experiment. All of this is made possible from accomplished and skillful performances. As Brooke, Ilana Becker’s lovable charm disarms us. We jeer at her ignorance and uncultured opinions but as warm tears tumble down her cheek, we feel a sharp pain for our part in dehumanizing her. Through Ms. Becker’s sensitive and very funny portrayal, we see ourselves reflected in those whose cruelty we condemn. Matt Servitto’s Jay is obnoxious, entitled, successful and educated. Armed with a similar charm, he is disarmingly aloof, filling the room with a kind of misguided dad charisma. We chuckle at his absurdity and then punch ourselves in the face for ever trusting him. I won’t be the only one to take notice of Zonya Love’s radiant and subdued performance. Strategically directed, Ms. Love’s Brittany embodies a magnetically apathetic physicality while delving deep within a lifetime of despair. Her final moments on stage recount a bitter and tragic life. And her choices strain our capacity to remain sympathetic. Of course, one must mention the maestro, Todd Solondz. This is his first play and before now I’d never heard of him. And there’s a good chance you hadn’t either. He’s a seasoned filmmaker, though he’s never amassed a huge audience. But it is thrilling to encounter a sharp persona commanding such fresh satirical bite. An emotionally intelligent artist with disregard for solemnity or overly-agreeable conventions. Considering our current climate, Mr. Solondz could prove to be a notable and influential artist of this epoch. As we venture further into our digital age, our lives and relationships can seem frustratingly nuanced. At best they appear unintelligible; at worst, utterly hopeless. But the brilliance lying within Emma and Max is that no matter how villainous some characters may appear or how irrational we are to forgive their trespasses, we can’t stop rooting for them. Maybe not to become more financially successful. Maybe to become more understanding. Maybe to be happier. Maybe, we just hope they’ll keep going. To stay afloat. To swim and not to drown. 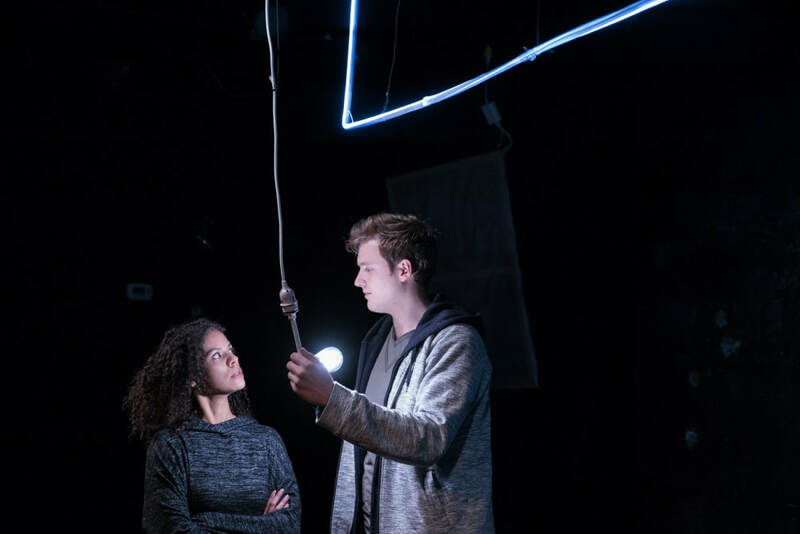 James & Jamesy In The Dark, now running at Soho Playhouse thru October 14 and directed by David MacMurray Smith, is an outer space romp exploring our perceptions of life. And although that may sound daunting, its themes are easily accessible thanks to Aaron Malkin’s and Alastair Knowles’ unparalleled charm and playfulness. Something only seasoned clowns could pull off. It’s silly, clean, very sweet and as intelligent as any piece of theatre you’re likely to see this year. And it doesn’t hurt that they wear lampshades on their heads. We begin in darkness. And then there is one, small, fast-moving light. And then two. They race across a dark abyss until finally beaming to the stage and transforming into our actors. After a bit of stumbling around, they bump into one another and explore a playful and curious existence. There’s no easily discernable story arch here. 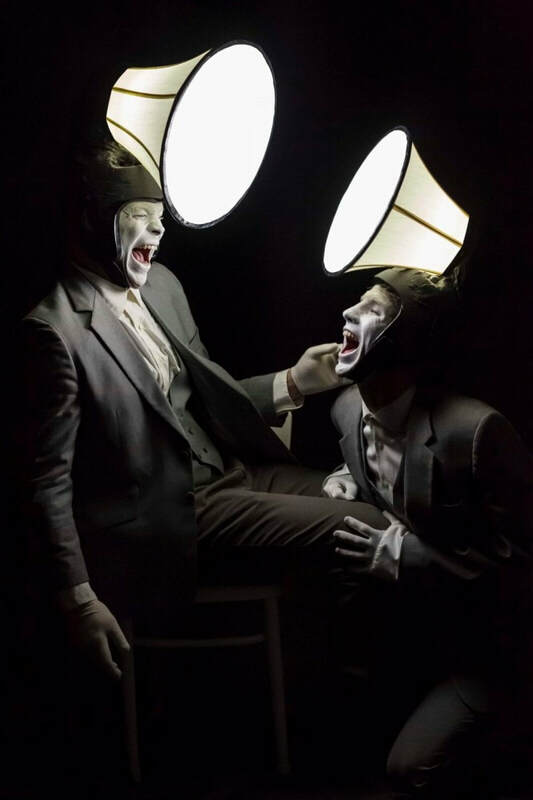 James & Jamesy is a clowning play and the entire experience feels like a highly talented series of theatre games. One game leads directly into the next. The journey matters more than where they’re going, and that is almost entirely the meaning of the play. Each new game reveals a desire for companionship, sexuality, a limited ability to perceive the world, limited ability to accurately recall recent history, an instinct for utility, hope for something else beyond this life, to name a few. Each idea is skillfully (and indirectly) expressed with silliness, charm and naiveté. Sexuality, for instance, is portrayed with such modesty and playfulness that we experience it as the overwhelming excitement of not being alone. The sensation of touch for the first time leads to a fit of giggling pleasure. In another game, exploring limits in perspective, James and Jamesy notice each other’s back for the first time. Astonished at this new discovery, they struggle to understand why their friend is incapable of seeing what lies in plain sight. Although these instances may seem frivolous at first glance, it is an inspiring experience as they occur relentlessly. James, played by Aaron Malkin and Jamesy, played by Alastair Knowles are nothing short of magnetic. 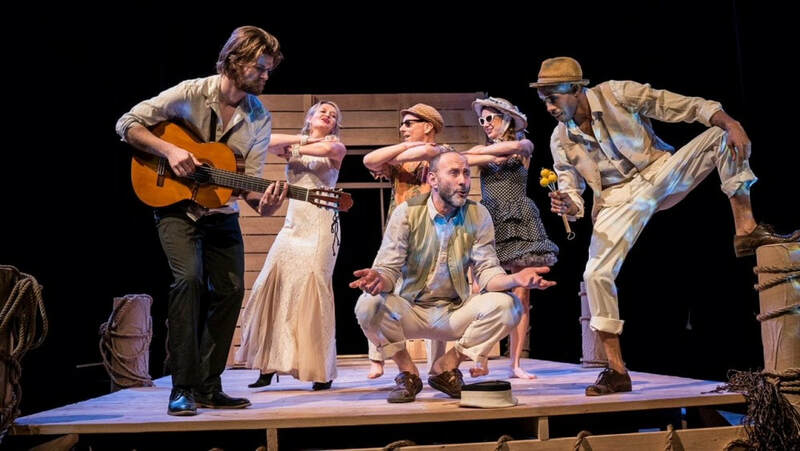 Their openness and emotional intelligence is dazzling and their joy while performing this show is infectious. Both have long-standing relationships to director David MacMurray Smith from working with him on several projects in the past. And so we are blessed by a remarkable display of chemistry. Mr. Smith has orchestrated a profound and tidy work. Not only guiding his actors toward a remarkable and seamless performance, but creating a tantalizing aesthetic not to be missed. At only 75 minutes, it is perhaps the most concentrated expression of minimalism I’ve seen. An unmistakable atmosphere penetrates our instinctual curiosities of existence. Infinite darkness engulfs self-aware lighting. Clothing complements its mood. Grey makeup, grey suits, even the hands of the actors are covered by grey fabric. Upon each head is a lamp shade (the primary source of lighting) attached to what appears to be black boxing headgear. An appealing and otherworldly impression. The entire aesthetic seems familiar and at the same time retains a kind of alien and inorganic presence. There is a lot to dissect within James & Jamesy In The Dark. But its most powerful quality is kindness. It is a production we need today. It works to bypass our deeply held insecurity of needing to be right. It boldly embraces our investigation into reason and knowledge with a sense of playfulness and companionship so often missing in our adult world. It’s not that James and Jamesy always get along. Throughout the entire play, there is always an underlying tension and conflict. But despite any conflict, fear, insecurity or stupidity, there is an unwavering kindness. James and Jamesy are often frightened by their new discoveries, but together they venture toward them. During the show, house lights rise on the audience. And we sit there with these alien beings. All of us, observing each other, together for the first time. We become a collective. We become a “We.” There is no need for scorn while making mistakes or feeling shame in the face of our own naiveté. There is only moving forward. No shouting. No hateful speech. No insensitivities. Just a resolute and joyful playfulness, trembling as we face our journey, wherever it may go. 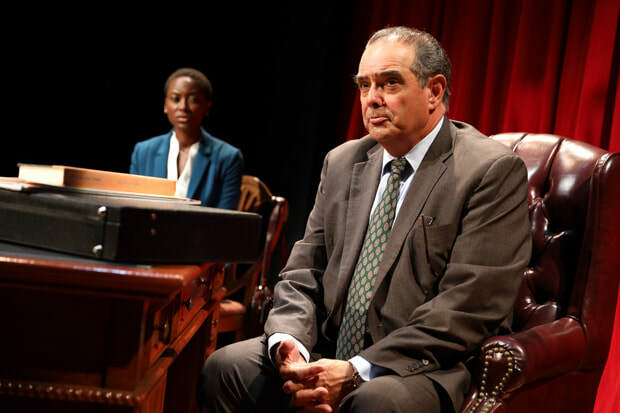 Commissioned by Arena Stage in 2013, The Originalist by John Strand surrounds Supreme Court Justice Antonin Scalia. The play, directed by Molly Smith, remounted at 59e59 thru August 19, is perhaps more relevant than ever before. Antonin Scalia (Edward Gero) arrives on campus to lecture young, doting, conservative minds. The discourse runs smoothly until Cat (Tracy Ifeachor), a liberal African American student, confronts his traditional talking points only to quickly become his newest clerk. In just over an hour and a half, The Originalist glides through recent landmark cases leading to Scalia’s dissent in the 2013 United States v Windsor case which struck down the 1996 Defense of Marriage Act. The infamous Supreme Court Judge is embodied by Washington DC based Edward Gero. As Scalia, he is effortlessly charming, distinctly cultured and frustratingly dogmatic. He sings opera to our applause, impersonates Ted Kennedy to our laughter and refuses to consider equal rights arguments regarding gay people and minorities. Mr. Gero’s respect for the Justice is transparent as he moves through a transformative, articulate and lovable performance. It is a masterful and surprisingly sympathetic portrait of a powerful and contradictory historical figure. His Scalia is a creature of habit. His brain heats and his body emboldens, assessing every word debated, calculating his opponent’s weakness. When comforting Cat, he listens with boundless compassion. We feel his heartbeat couple with her emotional well-being. A compelling duality, this emotional and intellectual life revealed by Mr. Gero is a major reason why you may wish to see this divisive production. ​Scalia is a historical figure demanding a definitive form through voice, body and spirit. Otherwise, it wouldn’t be Antonin Scalia. Cat is a more elusive character who, at times, behaves as a mechanism devised to influence our polarized opinions of the Judge; making him appear more compassionate and his ideas more relatable. Cat is gifted at stirring backstory but no matter how desperate her history may become, these added details feel manipulated to construct a more sympathetic Scalia. However, in transcending this challenge, Ms. Ifeachor’s acting is like a virtuoso jazz musician. Her instincts command this fiery character. Her Cat is not a definitive form like Scalia. Instead, Cat is a culmination of quick, unfiltered, moment-to-moment, dynamic expressions. While debating her conservative colleague, Brad (played skillfully by Brett Mack), their powerful minds passionately veer from topic to topic, racing across the political map. Their exchange ranges from race relations to four percent of the founders being gay to throwing pizza at each other across the room. As Brad attempts to convert Cat to conservatism, the talented Ms. Ifeachor boldly parries each of Brad’s affronts like an agile fencer. Through Ms. Ifeachor we are gifted a challenging portrait of powerful liberalism, desperate enough to consider the center. The staging is from Arena’s Artistic Director, Molly Smith. Dignified, simple and aside from one messy corner of a law library, it’s only the bare necessities. A chair, a desk, a rectangle of light on the ground for a hospital bed. Characters move through shadows and blocks of light. Like fragmented memories of our echoing civility, fading into history. John Strand’s play is a brave and talented work. He successfully portrays Antonin Scalia as a kind human being; a daring accomplishment considering Scalia is often decried a monster. But Scalia was also very loved. And those opposing him were also condemned as monsters. Mr. Strand’s play is a discourse from two antagonistic ideologies, mixed in friendship, moving together toward compromise. To a center point. To a place without monsters. Or perhaps where monsters meet. And onto the point. Why is this entering into our theatre consciousness? It’s New York City and the audience was certainly liberal. The recurrent outbursts were hints. This is a play about someone who liberals do not exactly appreciate. And yet the audience remained captivated. It’s the ideas this audience was hungry for. But it’s a great performance from two very different actors and it’s their exceptional performances which make the ideas accessible. We, in this time period have a hunger for dangerous perspectives and within a safe space we can contemplate frightening human perspectives. Not an angry text bubble on a phone. Not a charming and manipulative pundit. Not shouting facts at someone deaf to logic. Not eschewing compassion, comfortably clinging to cold facts. We blind monsters are beginning to see each other and recognize ourselves. And as we embrace others’ emotional reality, we are forced to face the facts of our shared existence.